This Friday night, May 9th, will kick off the 5-race Xtra Mart Xtra D Series at Stafford Motor Speedway. Stafford Speedway's Late Model drivers will duel this Friday night in a 60-lap feature with the race winner taking home total posted awards of $1,475. The 60-lap Late Model feature event will carry a larger purse with the winner's check paying out $1,125 and there is $1,000 in bonus money from Xtra Mart Convenience Stores that will be split evenly among the top-5 finishers. Add in the $125.00 in contingency money from CT Trailers and a $25.00 gas certificate from New England Racing Fuel, and the winner of Friday night's 60-lap Late Model Xtra Mart Xtra D feature event will take home $1,450 in cash and a $25 gas credit from New England Racing Fuel. The Late Model field is stacked with competitive cars and this Friday night's 60-lap feature should be an exciting event. The 2014 season at Stafford has seen two winners in the first two races of the season, former Late Model track champion Jay Stuart won the season opening NAPA Spring Sizzler event and defending Late Model champion Adam Gray won last Friday night's feature event. There are several other former Stafford track champions that will be in Friday night's Late Model field including Cory Casagrande and Michael Bennett, who are both former Limited Late Model champions, Kevin Gambacorta, who is a former DARE Stock and Limited Late Model champion, and Tom Fearn , who is a former ProStock champion. They will be joined by Late Model veterans Jim Mavlouganes, Jim Peterson and Dennis Botticello as well as a stellar rookie crop including Kyle Casagrande, Josh Wood, and Mark Heim. With such a stellar field taking the green flag, it's anybody's guess as to who will come away from Friday night with the checkered flag and $1,475 in winnings. One driver who has to be considered among the favorites to win the race is hometown driver J.J. Hill. Hill has scored 4 career Late Model victories at Stafford and of those 4 wins, 2 have come in extra distance feature events. Hill's first career Late Model victory was in a 100-lap feature event in 2010 and he won the 40-lap Xtra Mart Xtra D feature in 2012. Hill has had a slow start to the 2014 season and a win in the prestigious 60-lap race could be just what he needs to get his season back on track. 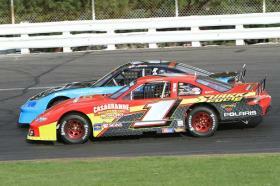 "Any time you can race for extra money it's a good thing," said Late Model driver J.J. Hill. "We have a few extra names with on the car sponsorship wise versus what we had last season, but extra money is always good. You can put that bonus money towards a tire or maybe buy some extra fuel. Every extra dollar comes in handy and I have to thank Xtra Mart for putting up the bonus money for us this Friday night. I'm a big fan of letting the race come to you. It's pretty tough to let the race come to you in 30 laps, you have to go, go, go. Not that 60 laps is an extremely long race, but it gives you a little more time to take an extra lap on making a pass or maybe make an adjustment during the race where during a 30-lap race there's no way you ever want to pit." The Late Model Xtra Mart Xtra D event gets underway at 6:15pm with qualifying heats and the main event feature events will begin around 7:00. Tickets for this Friday night's Late Model 60 Xtra Mart Xtra D are priced at $20.00 for adult general admission tickets, $5.00 for children ages 6-14, and children ages 5 and under are admitted free of charge when accompanied by an adult. Reserved seating is priced at $23.00 for all ages. All ticket prices include 10% CT Admission Tax and Stafford Motor Speedway offers free parking with overnight parking available.